Why is it important for large corporations to work with start-ups? It’s well known that businesses are being disrupted faster than ever before. Innovation launch and adoption cycles are dropping. For credit cards to reach 100 million users? 25 years. Online banking? 10 years. WhatsApp? 2 years. Candy Crush? A matter of months. Entrepreneurial start-ups are one of the main driving forces for this acceleration. Almost 65% of Fortune 500 companies joined the list in the last 20 years. Big businesses are hurting - and they want in on the act. In a recent survey with our partners Match-Maker Ventures (MMV), we found that 79% of corporates have already collaborated with start-ups in some way, and 85% of those who haven’t yet are interested in doing so. Most are now using a variety of models to engage with start-ups. Some have established venture capital funds, others prefer to run incubator programmes to test out the relationship with start-ups in the first place, whilst others adopt an accelerator approach to offer grow-on support (Figure 1). Typically, they will offer funding – often for a “Phase 0” pilot with defined goals and bounds to reach a minimum viable product, and if things go well, they increase their exposure, offering training, coaching, and potentially, acquisition. There are many great examples of corporate/start-up collaboration: Telefonica’s Wayra initiative has over 420 start-ups with a portfolio value of €155m; Coca Cola, Engie, Cisco, Unilever and Qualcomm are other examples amongst hundreds across different sectors. Getting ahead of disruption and delivering breakthroughs: The most common rationale is that if you have already partnered with a ground-breaking start-up bringing disruptive new ideas and technologies to market, it creates an opportunity to be first to market and avoid being disrupted yourself. Growing new knowledge and capability: Start-ups can help to improve internal processes and reduce costs, both through the products and services that they offer. Also involvement with them is relatively scalable and can be pared back during leaner times. Refreshing corporate culture : Entrepreneurs tend to be inspiring individuals full of dynamism, and collaborating with and potentially recruiting them could be a source of entrepreneurial spirit which could spark intrapreneurship. Improving external perception: Partnering with start-ups can signal to customers and consumers that companies are more innovative, helping to strengthen brand value. Misaligned or unclear objectives: As mentioned above, there is a range of different corporate aims and expectations from start-up collaboration. Some corporates launch start-up vehicles because they see their competitors doing it without any clear strategic rationale or focus, and sometimes without full top management endorsement. Start-ups too usually have very specific ambitions and motivations. If the aims are unclear or misaligned, or if top management are not actively supportive, then it’s unlikely the collaboration will deliver success. Inadequate resourcing: Working with start-ups requires focused management effort and funding, not just to scout, screen and validate potential start-ups but also to engage and integrate them, and to nurture the relationship throughout its whole lifecycle. Misunderstanding of the risk profile: Traditional and well-established firms tend to be relatively more risk-averse in terms of joint venture or acquisition strategies. On the other hand, start-ups at early stages represent high-risk investments. Almost 50% fail within the first four years, and this creates a perception amongst large companies that “we never get anything out of working with start-ups”. Cultural mis-match: Cultural aspects might differ greatly between young, alternative entrepreneurs and traditional, old-school corporates. Sometimes negotiations and communications are dealt by ageing senior executives at parent firms, especially if there are large sums of money at stake. Simply put, combining free-thinking hipsters and corporate executives can be like mixing chalk and cheese, leading to misunderstandings on both sides. Be clear about your strategy and where you are the most likely to be disrupted: Before deciding on which start-up(s) to work with, larger companies must form a very clear vision of what their aims are and how the collaboration fits within their business strategy. A valuable way to start thinking about who to target is to focus on start-ups with the greatest potential for threatening and disrupting the parent companies’ business models and strategies – and that includes those from adjacent industries. Once the strategic aims are clear, ensure that you have the right KPIs to track and communicate progress, covering both leading and lagging indicators. Get your internal arrangements sorted out: Make sure you have the right organization, resources, capabilities and processes to engage with start-ups, considering the whole life-cycle not just the initial phases. Be prepared to consider different forms of engagement, and consider different roles such as mentor, manager, networker and C-level sponsor. Fund agile pilots in an accelerator: The success of many venture capital funds and large corporates like Cisco investing in start-ups is based on creating the right incentives for entrepreneurs. Usually, the method they use is to incentivise them by supporting a paid pilot (Phase 0) with limited funds from the parent company. Start-ups are then enticed with promises of long term contracts, investments or relationships if initial trials work. Moreover, to attract the best potential candidates, it is beneficial not to require investor exclusivity at this stage. Since investment amounts are initially limited, this strategy allows corporations to place bets in multiple areas. 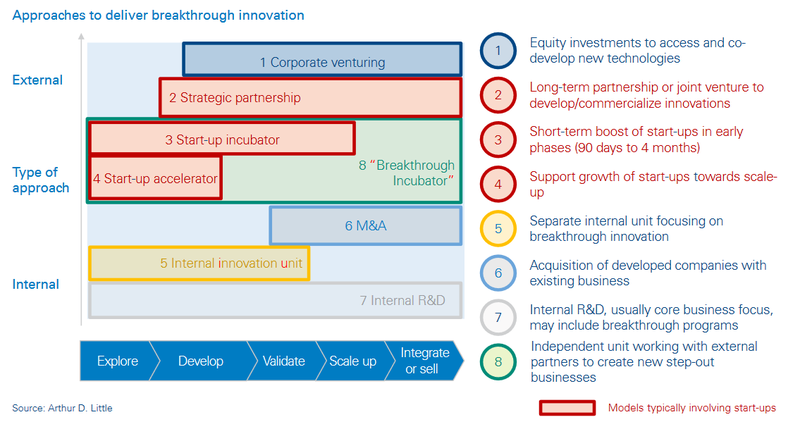 Incubate and develop relationships further: If the pilot stage proves successful, accelerating the cooperation into more systematic partnerships, such as joint ventures, is an effective next step. Corporates should provide not only financial backing, but also access to training, skills, resources, customers and networks to grow their businesses. The degree of support should increase in line with the increasing value and decreasing risk of the new business. Encourage intrapreneurship in the corporate: It is key to find influential internal sponsors (intrapreneurs) within the corporation whose activities are closely aligned with those of the start-ups, and who can effectively connect with ‘problem owners’ within the core operations. This is vital for helping to build a internal platform of enthusiasm for the new business, which leads to more support from internal staff, better inter-departmental collaboration, and more willingness to continue investment. Showcase examples of success: Create an atmosphere of optimism regarding start-ups’ progress, both within organisations and to the rest of the world. Every step of progress and every quick win should be positively and effectively communicated. Rapid prototyping and Minimum Viable Product approaches are vital in the early stages - ‘show me’ has much more impact than ‘tell me’. At the same time a sense of realism needs to maintained within the team to ensure feet are kept on the ground. Know when to part company: Given that investing in early stage start-ups is a high-risk activity, corporations should have a robust review process in place to make rapid and informed decisions about when to pull out – and conversely when to persevere. In this sense Phase 0 pilots are very valuable. Unsuccessful investments should not be considered as failures, but rather as an opportunity to learn from achievements and mistakes. The wave of corporate/start-up collaborations we see today is certainly much more than a fad. It’s just one aspect of the wider ecosystem revolution that is transforming corporate innovation. It makes sense to do it properly.